After the freeze frame springs to life, we see Fred Stalk (Sheldon Leonard) and the brutal idiot man-child Joker Robinson (Peter Whitney) interrogating and beating a man who has betrayed the United Defenders. 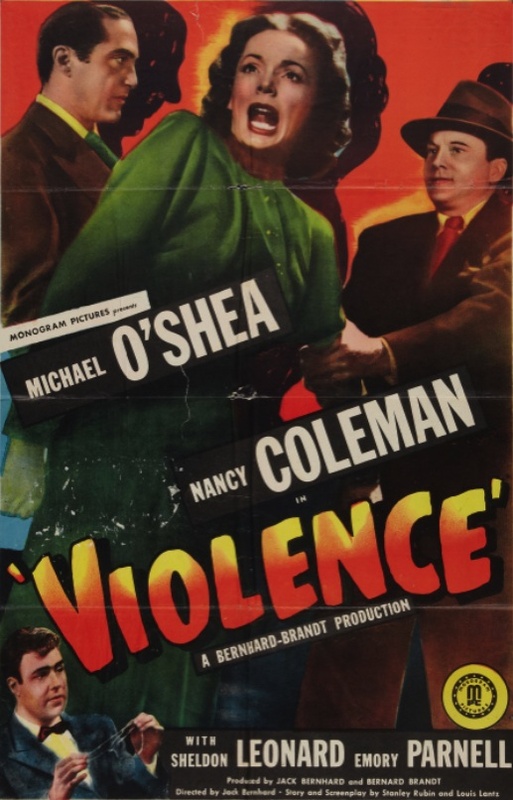 The man Stalk and Joker are beating is named Joe Donahue (Jimmy Clark), and his murder is the most violent thing about Violence, which generally doesn’t live up to its sizzling title or the promise of its first reel. Ann Dwire (Nancy Coleman) is undercover with the United Defenders. She’s operating under the name “Ann Mason” and is preparing material for an exposé of the organization for View magazine. Her methods of subterfuge would get her killed in less than 24 hours in the real world. When she calls in information to Ralph Borden (Pierre Watkin), her managing editor back in Chicago, she calls him from her apartment, even stating Borden’s full name and title to the concierge of her building, a kindly old man called Pop (Frank Reicher). Also, when it comes time to dispose of a letter from Borden, she doesn’t burn it, she just tears it up into smaller pieces (and her delicate fingers don’t do a very good job of it). The United Defenders recruit disgruntled World War II veterans, promising to fight against housing shortages and unemployment, but they’re really just a fascist organization whose purpose is to sow discord and promote violence. When a young veteran (Richard Irving) stands up at a meeting and tells the organization’s leader, True Dawson (Emory Parnell), that it seems as if his rhetoric only leads in one direction — violence — Dawson has a couple of his followers throw him out on his ear, which proves the young man’s point. Violence touches on a lot of hot-button issues, but doesn’t delve into them very deeply. (If you wanted deep treatises on post-war intolerance and creeping fascism in America in 1947, you had to be a kid listening to the radio show The Adventures of Superman. Most Hollywood productions just didn’t have the stones to get too specific.) For the most part, Violence uses its serious themes as window dressing for a brisk B movie that only aims to thrill. If Violence had been made a few years earlier, the United Defenders would have been Nazi fifth columnists. If it had been made a few years later, they would have been Communists. While on a trip back to Chicago to meet with her editor, Ann is in a taxi cab accident and loses her memory. She becomes Ann Mason through and through, even getting up to speak at a meeting and encouraging every man there to recruit friends … friends who aren’t afraid to use violence to get what they want. But to thicken the plot, her fiancé Steve Fuller (Michael O’Shea) accompanies her back to Los Angeles, and he seems to know what’s going on, even though he volunteers to work for the United Defenders. Coleman’s acting while she’s suffering from memory loss is pretty awful. She keeps looking pained and pressing her fingers to her temples, as though her problem is a bad headache, not post-traumatic retrograde amnesia. Violence is mildly entertaining, but its low budget and weak performances work against it. The editing is sloppy — there are a lot of jump cuts within scenes — and the amnesia aspect of the story is poorly handled. 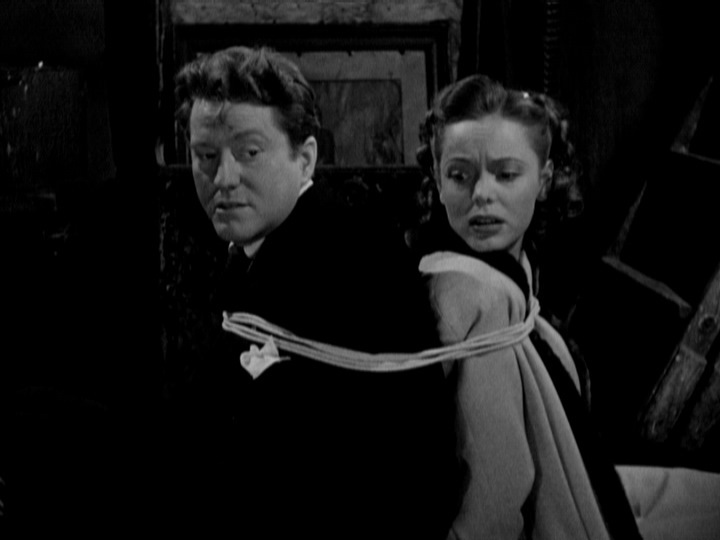 Violence was directed by Jack Bernhard, who made Decoy (1946), a film noir that has built up quite a reputation in recent years. I’ve seen Decoy twice, and I think it’s overrated, but it does have one thing going for it that is sorely missing in Violence, a truly loony and twisty plot. Posted in 1947, April 1947 and tagged Bernard Brandt, Bernhard-Brandt Productions, Carole Donne, Cay Forrester, Edward J. Kay, Emory Parnell, Film Noir, Frank Reicher, Henry Sharp, Jack Bernhard, Jason H. Bernie, Jimmy Clark, John Hamilton, Lewis Lantz, Michael O'Shea, Monogram Pictures, Nancy Coleman, Peter Whitney, Pierre Watkin, Richard Irving, Sheldon Leonard, Stanley Rubin, Violence, William Gould. Bookmark the permalink. It’s good to know Ann is so good at undercover work. Too bad it doesn’t live up to its title!